Acute injuries to the foot or ankle, such as fracture, dislocation and sprains are very common problems treated on a daily basis. An ankle sprain inadequately treated could result in a painful chronic condition. The ligaments may be weakened resulting in an unstable joint. This is not an uncommon problem, and can be treated quite successfully using contemporary techniques. In all cases, Dr. Marcus' focus is on early return to activity and prevention of a recurring injury. 1. "If you can move the part, then it isn't broken" This idea has kept many fractures from receiving proper treatment. The truth is that often you can walk with certain kinds of fractures. Seek immediate professional attention for you injury by your podiatrist. 2. "A Broken toe requires little or no professional treatment." A toe fracture requires prompt attention. If x-rays reveal it to be a simple, undisplaced fracture, care by your podiatrist usually can produce rapid relief. However, x-rays might identify a displaced or angulated break. 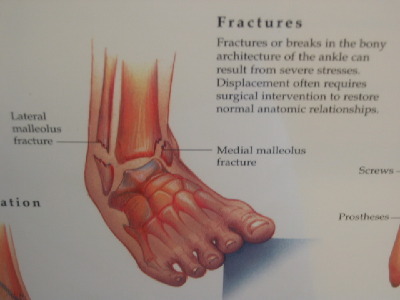 In such cases, prompt "setting" of the fracture by your podiatrist will help prevent improper or incomplete healing. Many patients develop post-fracture deformity of a toe, which in turn results in the formation of a painfully deformed digit with a most painful corn. 3. "Hot water should be used for all injuries to the foot and ankle" Actually, hot water makes the blood vessels open wide, causing greater swelling. More swelling means greater pressure on the nerves, which causes more pain. An ice bag wrapped in a towel has a contracting effect on blood vessels, produces a numbing effect, and prevents swelling and pain. Later, possibly 48 or 72 hours, warm compresses or soaks can be used. 4. "The application of an elastic bandage to a severely sprained ankle is adequate treatment." Ankle sprains often mean torn or severely overstretched ligaments. These should receive immediate care, such as x-ray examination and immobilization by a professional, splinting-i.e. (aircast) to reduce motion, casting and physiotherapy to ensure a normal recovery. Surgery may also be necessary. Therefore, an elastic bandage by itself may not prove to be adequate treatment. 5. "There is a difference between a fracture and a broken bone" They are not any different. Both are proper terms in describing a broken bone. Therefore a fracture is not any better than a broken bone.